Why did the police ignore this murder waiting to happen? Although the murder of 10-year-old Marissa Kennedy happened in Waldo County, it might’ve happened anywhere. Such abuse is that rampant and very often ignored. The neighbors had been aware of this, had heard the screaming and yelling during and after the beatings, and had responded. To the authorities. 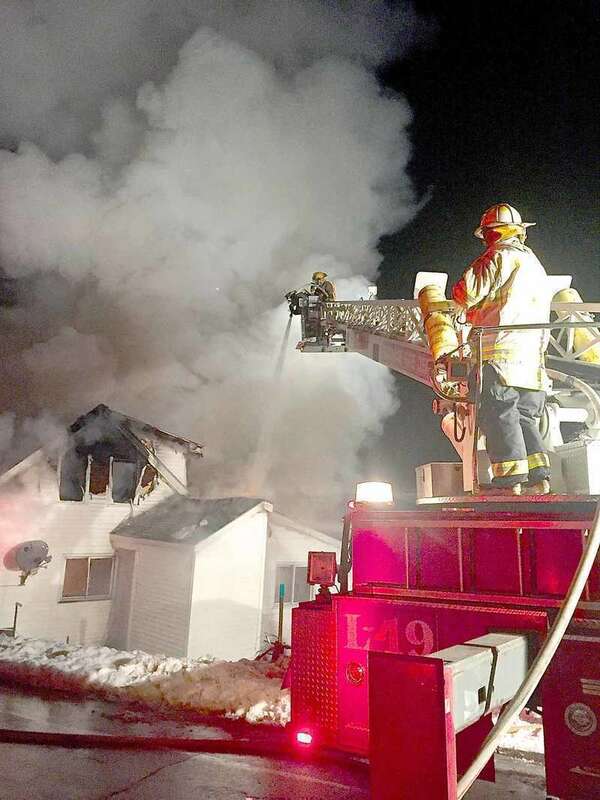 Through two home locations — in Bangor and Stockton Springs — police were notified. Why was the child not removed from the home? DHHS has stepped in with far less provocation. Yet nothing was done. 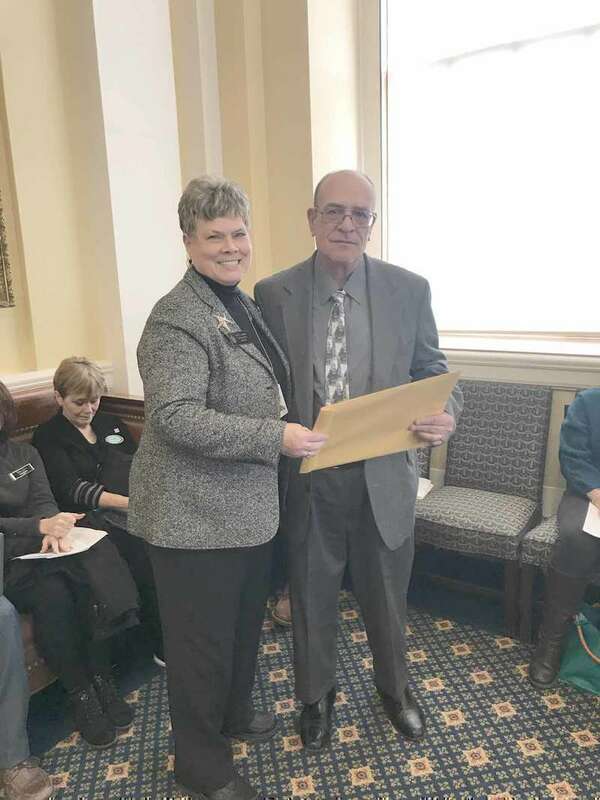 Editor’s note: On Wednesday, Feb. 28 Melissa Hinerman traveled to Augusta to participate in a public hearing in front of the criminal justice committee. She spoke in favor of two bills put forth by Rep. Will Tuell (R-E. Machias) and Sen. Joyce Maker (R-Calais). 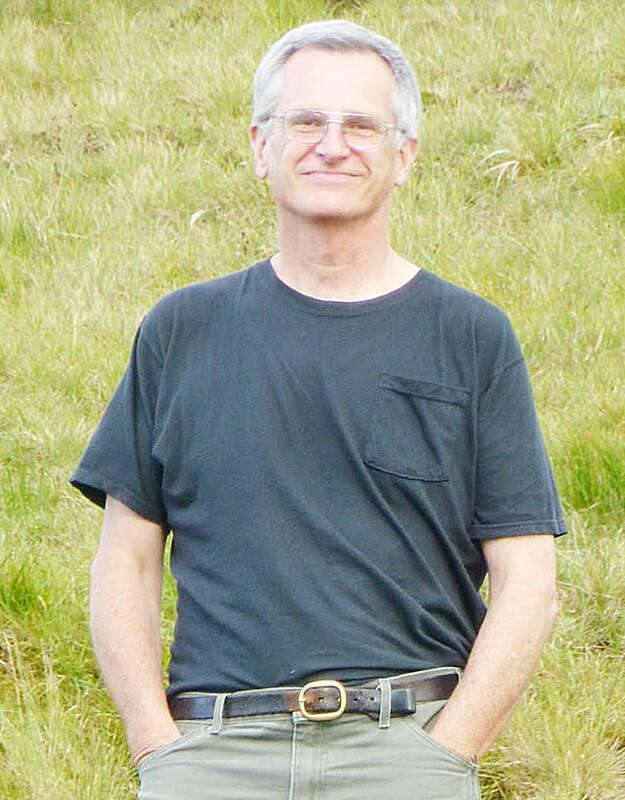 Hinerman is the founder of the Facebook page “Save Downeast Correctional Facility” and has a personal connection to the prison’s fate. This is an excerpt of the testimony she gave at the hearing. When Sherry Rier discovered a stack of letters from a grandmother who died before she was born, it felt like a dream come true. “For as long I could remember, I longed to talk to her, imagined she had written something that told me what she thought about, her struggles, hopes and dreams,” wrote Rier, who transcribed the stack of letters onto her blog, Voices of Ancestors. 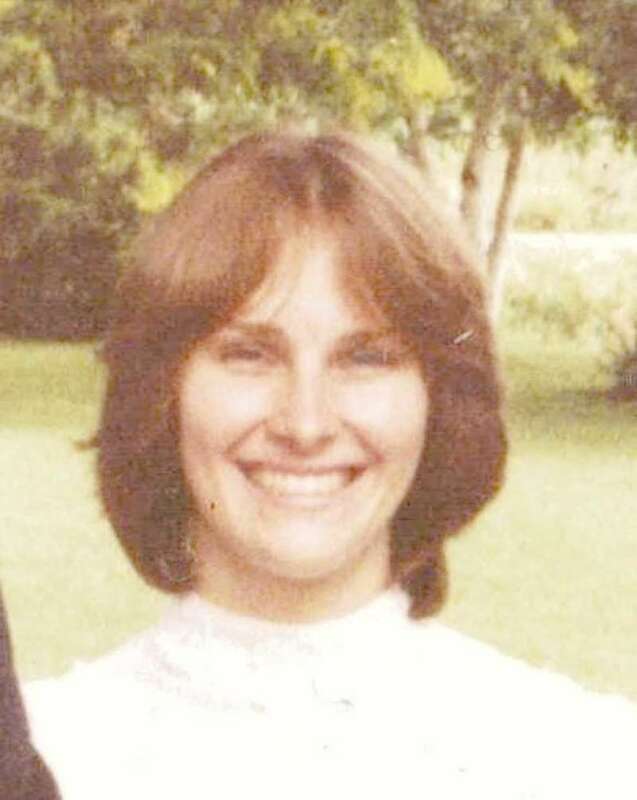 Editor’s note: This is the first of four chapters we will run from the story of Sherry Rier’s maternal grandmother, Harriet Means of Machias. For the background, see our Threads column on page 8. I’ve fallen several times over the past year and my doctor has recommended that I start a strength-training program to help prevent future falls. But at age 72, I’ve never lifted weights before and could use some help. What can you tell me? A benefit dance was held for the little boy who was injured in a car accident in Hancock earlier this fall. The music was provided by the band called Deep Six. There was a good turnout and not too cold an evening. Two groups in the community are joining forces at the Milbridge Public Library— a game club and a knitting group. Ed Latham is the organizer of the TableTop Game Club. He has been playing board games all his life. The games have gotten more expensive and more complicated. They involve more ways of thinking. It’s nothing like your typical board game; not at all. These games play for many hours and were made in Europe. Another week has flown by. Last Sunday, Feb. 25, I attended the Table of Plenty in Cherryfield hosted by the 4H Club. Not many ventured out but those there had a great time socializing with each other and getting caught up on what we all had been doing lately. Carmen Colbert of Bucks Harbor has been visiting her sister Joan Look of Harrington. It was a pleasure to see both of them there. This past week I have been trying to get caught up from my trip during school vacation. I guess my grandchildren wore me out. 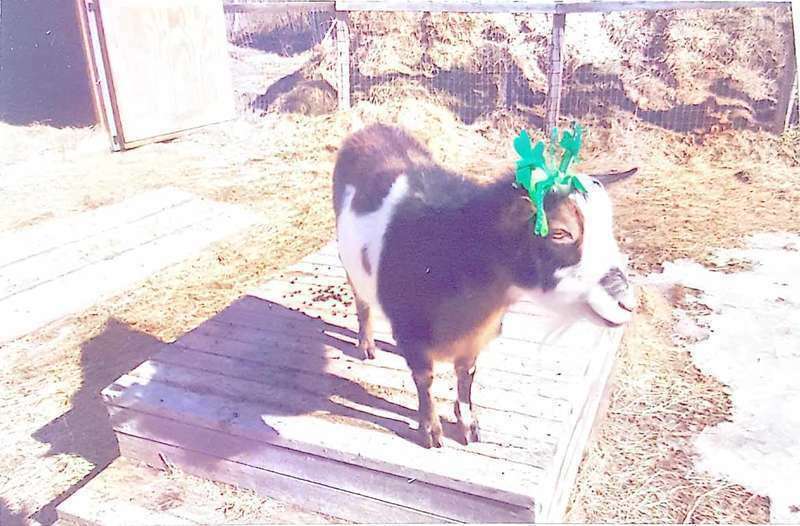 Ron and Linda have fun at Juskiddin Acres with holidays and for St. Patrick’s Day they have been dressing up goats. I was laughing so hard it was difficult to get good pictures. Went out Sunday morning and picked up $11 dollars worth of bottles on Route 192. Roads are starting to get rough. The frost heaves need to be marked. Visited with Carola on Wednesday the 28th. I can’t believe this month is over. Went into Little Seavey Lake to rescue a chicken Ruth Ann wanted me to take because her other chickens were picking on her. With March coming in like a wet lion, winter will soon be a memory and spring will burst out with flowers, green grass and a day closer to the first public supper of the year for the Whitneyville Public Library. Mark this date on your calendar—April 7 at 5 p.m. The Friends of the Library will be putting on the first supper of the season and it will be turkey with all the fixings along with Janet’s rolls, homemade pies and cakes with coffee, ice water and lemonade. So come out and enjoy some great company and a good meal. 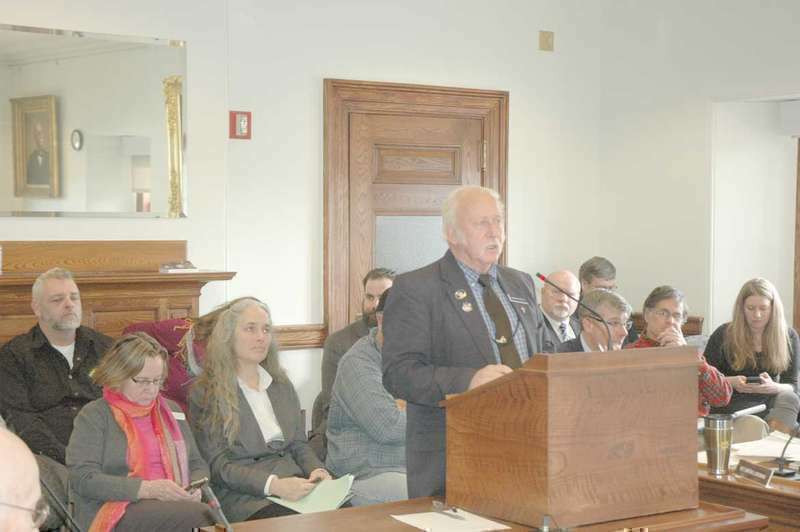 On Tuesdays for the past two months, I put on my red AARP Maine shirt, and drive to the State House. On my way I pick up friends who I have met through AARP, and we join dozens of other members to learn more about how we can make a difference. 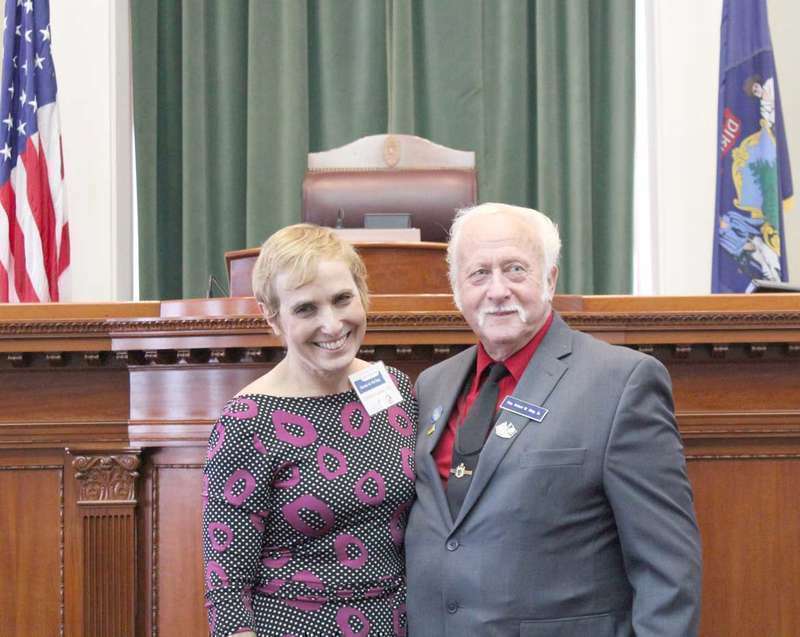 We meet with legislators, learn from experts on issues, practice testifying, and attend committee hearings, work sessions and Caucus on Aging meetings. Everyone at the state house knows it’s Tuesday because of our red shirts. Legislators remark on our consistent presence and we are excited to keep building the momentum! By the end of this week a nor’easter may have brought our snow cover back and frankly, I am okay with it. With the bare, March ground exposed, I can only see the chores it’s too early to begin, all waiting for me on the lawn and in the garden. The minute the ground is ready, I will begin what is sure to be a months-long project of deweeding my neglected garden and flower beds. Will Jonesporters take $450,000 from surplus to buy campground? 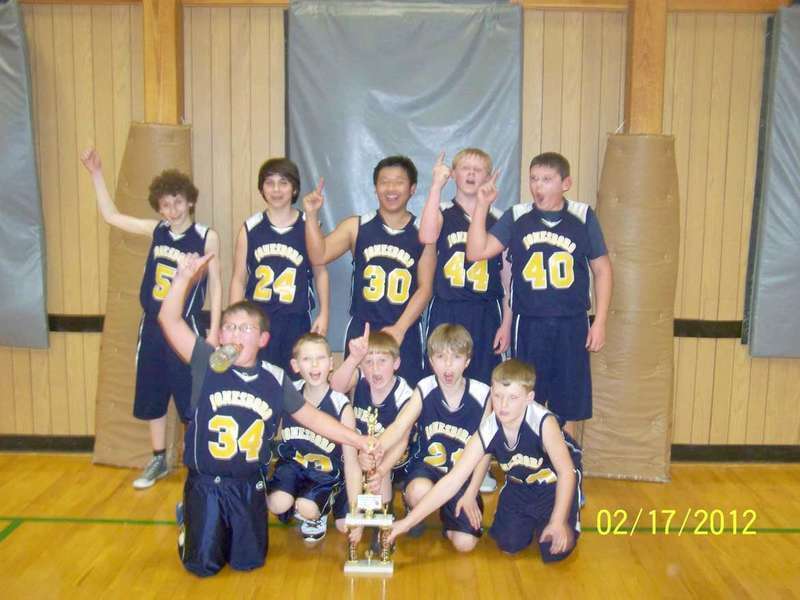 Twelve youth basketball teams will come from all over Washington County to compete in the first annual Camron Roberts Memorial Pee Wee Basketball Tournament to be held Friday, March 9 and Saturday, March 10 at Washington Academy in East Machias. Shelley Roberts said the tournament will be a positive, light hearted way to remember her son Camron, who passed away in August of 2017. There will be knockout games, skill challenges and throw-for-dough games held between the games, and they’ll play Camron’s favorite music, too. 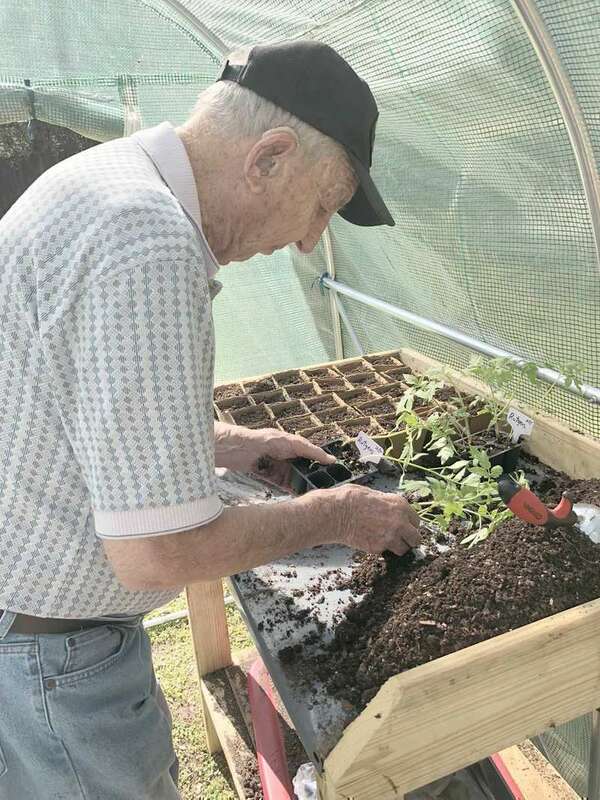 The Washington County Extension Association (WECA) seeks nominations for the 2018​ Norman W. Duzen Volunteer Award, which honors a Washington County resident whose volunteerism has enhanced the lives of community members. Fruit Tree Pruning, Grafting & Scion Exchange, Yoga, Tai Chi, Beginner & Intermediate Pottery are all slated for the coming month. Scholarships and sliding scales are available for all classes. Bestselling author Bruce Robert Coffin will give a talk and sign copies of his work on Wednesday, March 14 from 7 to 8:30 p.m. at Porter Memorial Library in Machias. Coffin’s new novel is entitled Beneath the Depths, the second of his Detective Byron series, published by HarperCollins. 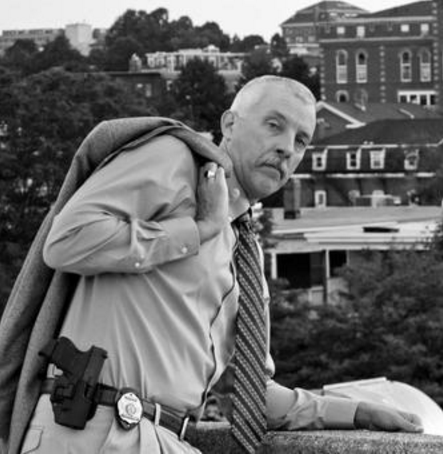 Fellow Maine writer Paul Doiron has called Coffin’s first crime novel, Among the Shadows, “...the best debut I’ve read in ages.” The talk is free and open to the public. Copies of Coffin’s books will be available for sale at the event. For more information, call the library at 255-3933. Reflexology has come to Machias, offered on a Friday afternoon at St. Aiden’s Church on Dublin Street. The sponsor is the Beth Wright Cancer Resource Center (BWC), based in Ellsworth but with many ties to Washington County where it was founded as the Choose Life Foundation by Beth Charczynski Wright before she succumbed to breast cancer at the age of 28. 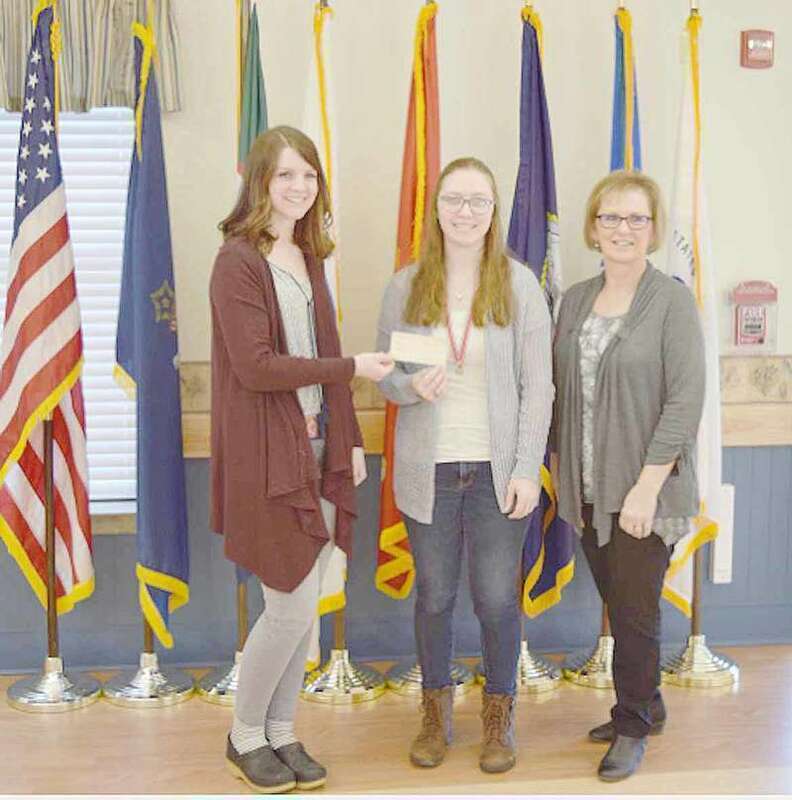 Maine State President of Children of the American Revolution, Cameryn Farnsworth, recently began fundraising for the activities department at Maine Veterans’ Homes in Machias. With a great deal of hard work, Cameryn was able to present Maine Veterans’ Homes with a very generous donation of $1,000. Her efforts were driven by compassion, as her donation was made in loving memory of her grandfather, Everett Farnsworth. There are, at the moment, two dozen candidates for governor in Maine. It’s entirely possible that Maine’s next governor will be elected with the support of less than a third of the voters. The number and diversity of candidates should be a cause for celebration, as a reflection of the growing interest in making Maine a better place. Instead of having just two candidates for governor, each one selected by a narrow swath of partisan voters, we can now hear more voices and more new ideas. Basketball Clinic at Narraguagus Gym- Intramural Athletics will be offering a free Basketball Clinic on March 4 and March 11 at the Narraguagus Gym for grades K-6. Grades K-2 time is 4 – 5 p.m. and Grades 3-6 time is 5:15 to 7 pm. For more information, call Dan at 461-9090 or Mindy at 461-8878. 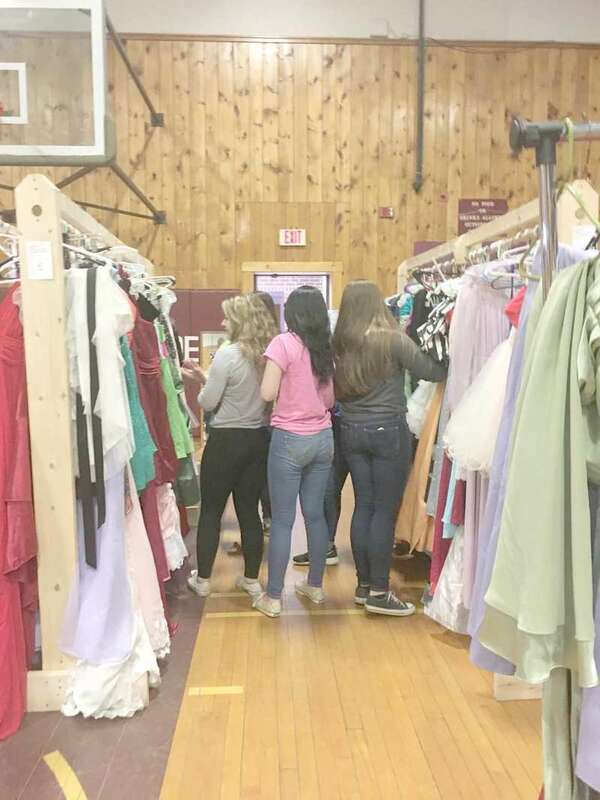 Members of the Washington Academy National Honor Society (NHS) are collecting prom dress donations for their annual Prom Dress Boutique to be held on Saturday, April 7. The University of Maine at Machias has received a $200,000 Davis Educational Foundation grant to improve student retention and academic performance by expanding a program called Supplemental Instruction. SI has been offered at the university in STEM subjects since 2015. The new funding allows the university to expand the program to include courses in all disciplines. The grant was received from the Davis Education Foundation established by Stanton and Elisabeth Davis after Mr. Davis’s retirement as chairman of Shaw’s Supermarkets, Inc.
Congratulations to the following local students who have achieved the WCCC’s Dean’s and President’s lists. Principal Leavitt and the faculty of Machias Memorial High School proudly presents the 2017-2018 Quarter 2 honor roll for academic excellence. The following students have earned the distinction of being recognized as achieving high honors or honors. 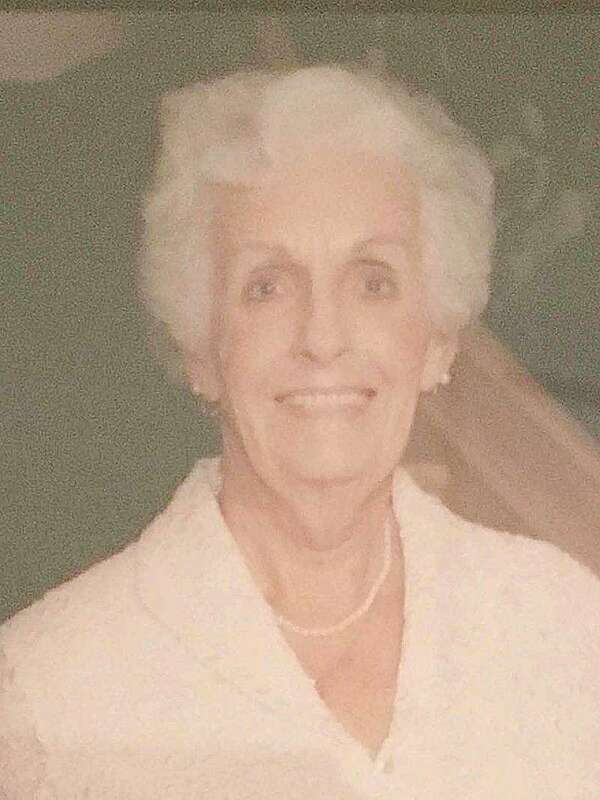 Dorothy Lakeman Marshall, 89, beloved mother, grandmother and friend, ended her earthly journey on March 1, 2018 at her home in Bluffton, South Carolina. Lissa Nash Mutty, 66, passed away peacefully on February 26, 2018 at D.E.C.H. surrounded by her closest family. She succumbed to her long battle of cancer. She was born in Addison on September 26, 1951 the daughter of the late Betty and Clayton Nash. Drawing from the areas of mindfulness, stress reduction, brain science and positive psychology, in this four-week series we will explore specific tools and practices that can be used to enhance our level-of well-being and flourish in life. There is an opportunity in the Addison area for those who live alone or know someone who does. Neighborhood Helpers (a division of Friends of the Church on the Hill) is planning a program of well-being phone calls to those who desire them. Please call Cathy Fonda at 483-4655 if you or someone you know would like a daily phone call. There is no cost involved. The program will begin April 1. 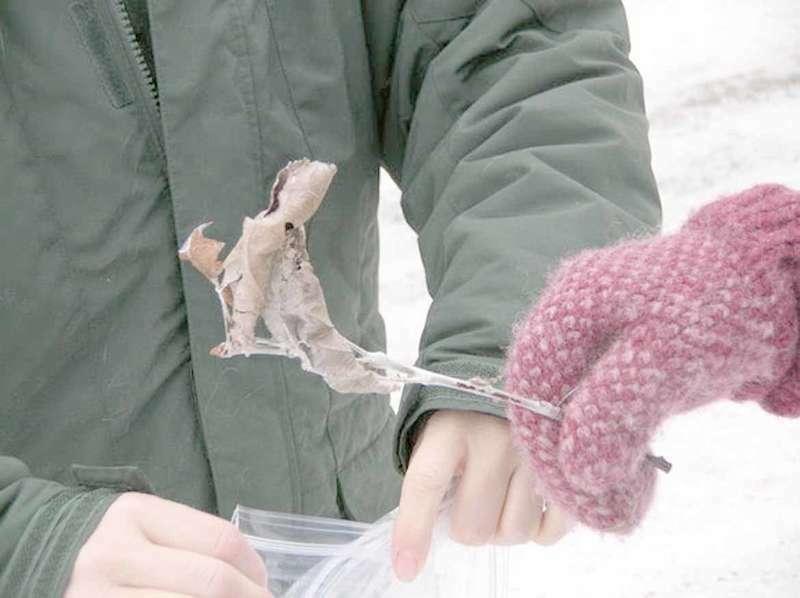 Entomologists from the Maine Department of Agriculture, Conservation and Forestry remind you that now is the time to remove browntail caterpillars from trees that are accessible. Browntail caterpillars cause a poison ivy-like rash and they are impacting a broad swath of Maine. Contact with this caterpillar’s hairs can cause severe reactions for some individuals. 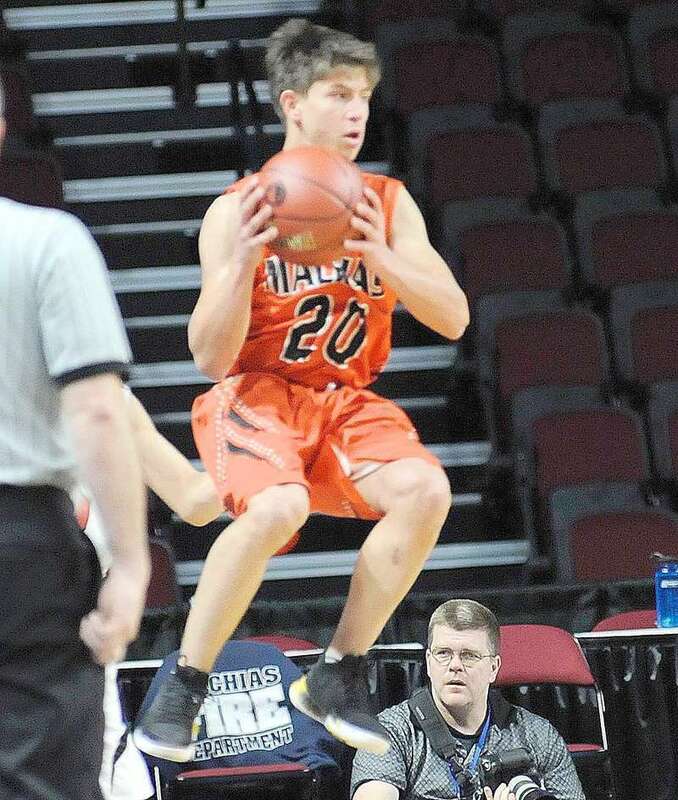 The sixth-seeded Penobscot Valley Howlers of Howland ended the Calais Blue Devils boys’ season on Feb. 14 in Howland by a score of 66-49. The Howlers came out of a low-scoring first quarter with a 6-4 lead but over the next eight minutes the hosts outscored Darren Constant’s club 26-11 for a sizable half-time lead of 32-15. The Eastport Arts Center’s KinderArts session for March will be led by artist and educator Fern Hilyard. The free program, held on Thursdays, March 8, 15 and 29 from 9:30-10:15 a.m., is designed to encourage young children to explore the visual and performing arts in a secure and social environment through hands-on experiences. Children up to age five are welcome to attend, but must come with a caregiver. EAC’s monthly Kids’ Movie and Food Club continues with a meeting featuring J.K. Rowling’s Harry Potter and the Sorcerer’s Stone from noon- 4 p.m., Saturday, March 10. In addition to a screening of the 2001 film version of the story, participants will enjoy a magic-themed food activity. EAC Island Institute Fellow Tarah Waters hosts this program which features movies paired with food activities. Maine State Music Theatre is seeking applicants for its highly regarded Educational Fellowship Program this summer from May 21-August 26, 2018. The deadline to apply is March 15, 2018. The program serves to bridge the gap between education and the professional world and allows those interested in working in theatre access to the best and brightest casts, crews, and administrators from Broadway, national tours, and regional theatres. Two new artworks have arrived on campus at the University of Maine at Machias. Both donated by Machias resident Sandi Bryand, the sculptures are in place by the pond at the center of campus. One metalwork sculpture by Peter Jackson, a piece called “Ta Da,” is suggestive of an anchor and serves as a nod to the seafaring heritage of the region. 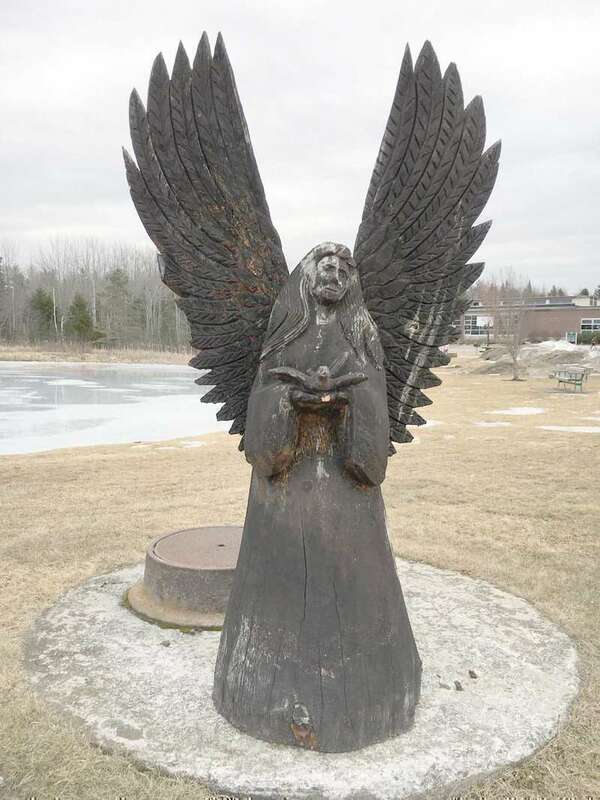 The other, by Ray Murphy of Hancock, is a chainsaw sculpture of an angel. Bryand purchased both pieces directly from the artists before donating them to the university. 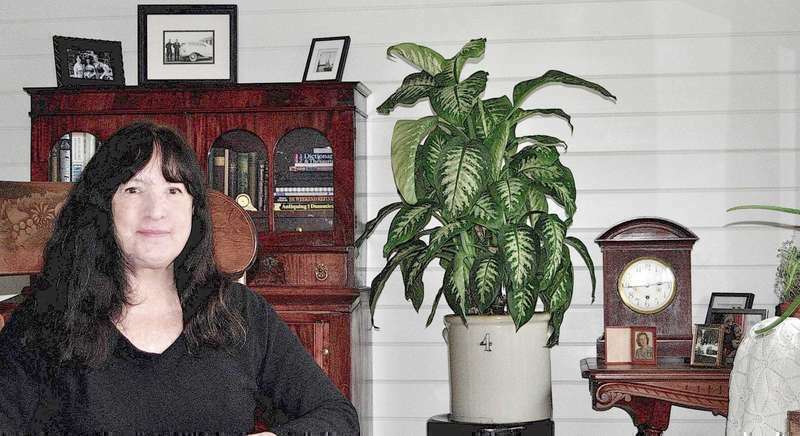 Ruth Fenton, a 57-year-old Jonesport wife, mother, grandmother and activist, has written all of her life, starting in high school where she wrote for the school newspaper and took every writing course offered, to the present day. 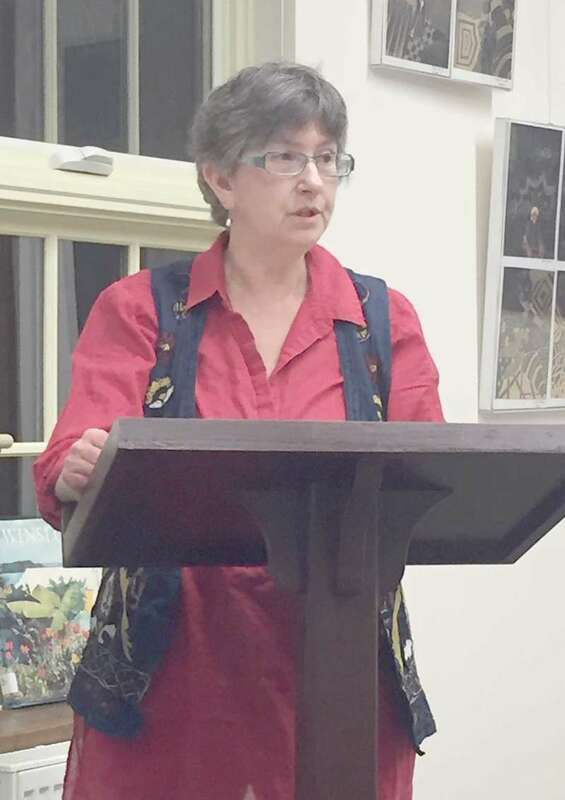 “I enjoy the craft,” she said at her kitchen table last week while preparing for a reading at the local library that evening. The second-seeded Mount Desert Island Trojans (MDI) proved to be a tough matchup for the Washington Academy Raiders. They only met once during the regular season, and that game was played down in Bar Harbor on Dec. 19. The Trojans completely dominated and won 79-43. The young Trojans finished as a number two seed in the Heal Point standings with a 15-3 record while the Raiders closed out their regular season in seventh place with a 13-5 mark. 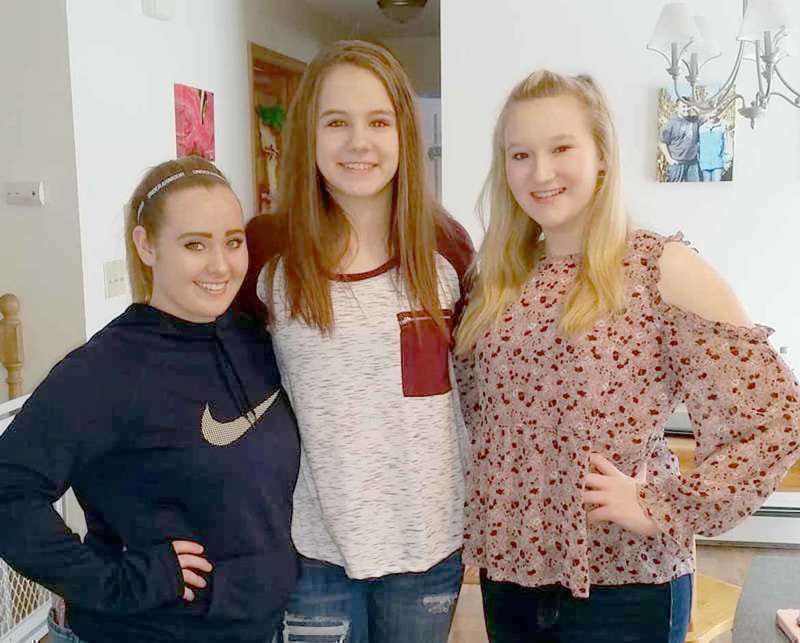 For over two and half decades now, the Calais Lady Blue Devils and Narraguagus Knights have been bitter rivals on the basketball court, and it looks like that may go on for at least a couple more years. 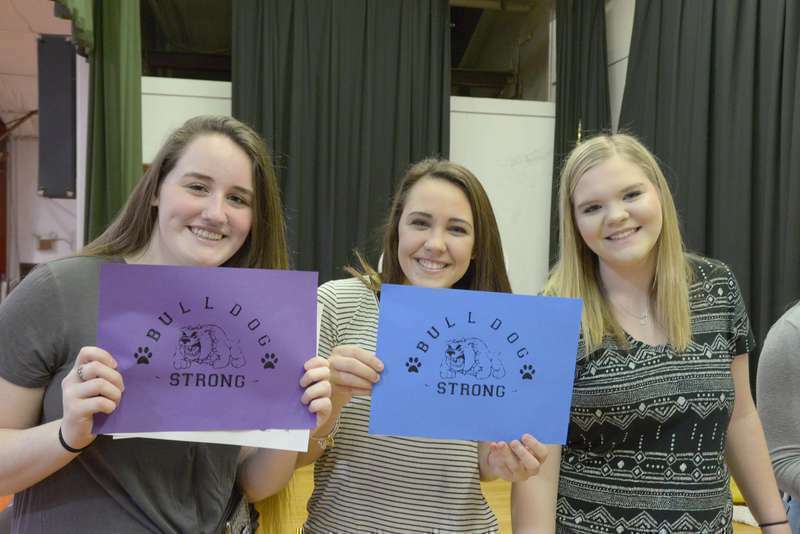 The Calais girls’ program ranks at the very top when it comes to a successful program. No high school girls’ program can match the success and consistency of the teams produced in the border city from coaches Bob McShane, to Dana Redding, and now Arnold Clark. 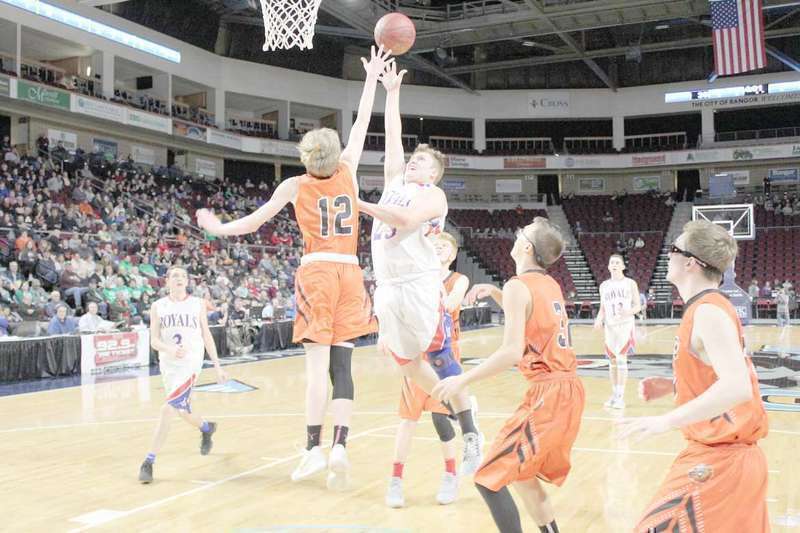 Two teams very familiar with each other battled 32 minutes for the right to represent Northern Maine in the class D state title game in Augusta on March 3rd. Top seeded Woodland and number two Jonesport-Beals would meet for the 3rd time after splitting two regular season contests. 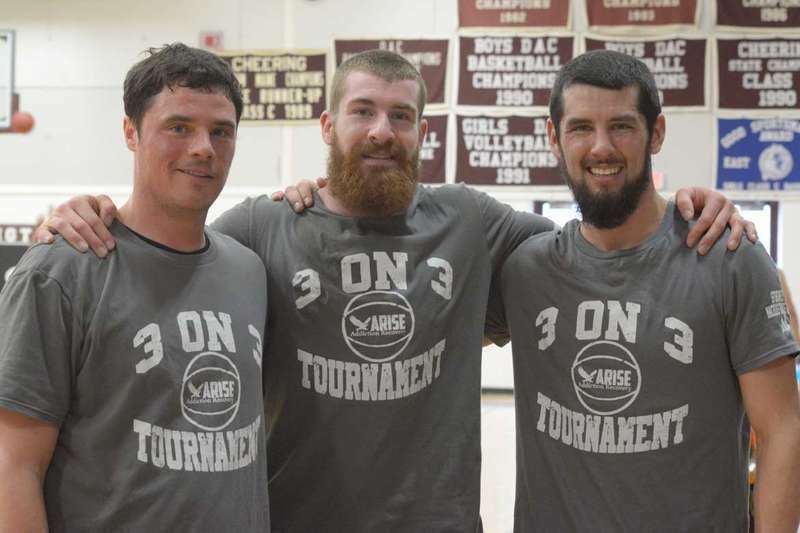 They played both games at the end of the season in a three-day stretch with the Royals winning in Woodland 40-37 and Woodland winning in Jonesport 50-45. Freshman Alvin Beal gets off a smooth three-pointer over SA defender. 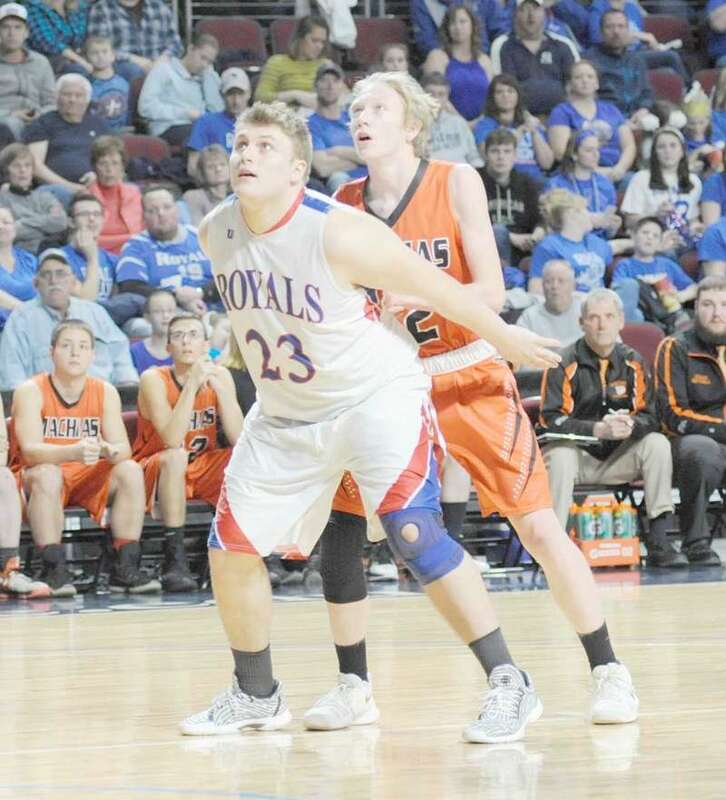 Royal forward Kaiden Crowley takes soft one-hander easily over Garrett Siltz. Not counting the storm that is descending on us as I write, AOS 96 schools have missed a grand total of three days due to inclement weather this year. I confess that it feels like more to me, though my children surely feel they haven’t had any. That number will climb this week, and already schools are scheduling several installments of Saturday School to ensure students aren’t catching the bus in July. U.S. Senators Susan Collins and Angus King announced that Cianbro Corp. of Pittsfield was awarded a $7,709,000 contract to repair the north and south Helix House ice shields at the Naval communications station in Cutler. The work is expected to be completed by November, 2018. 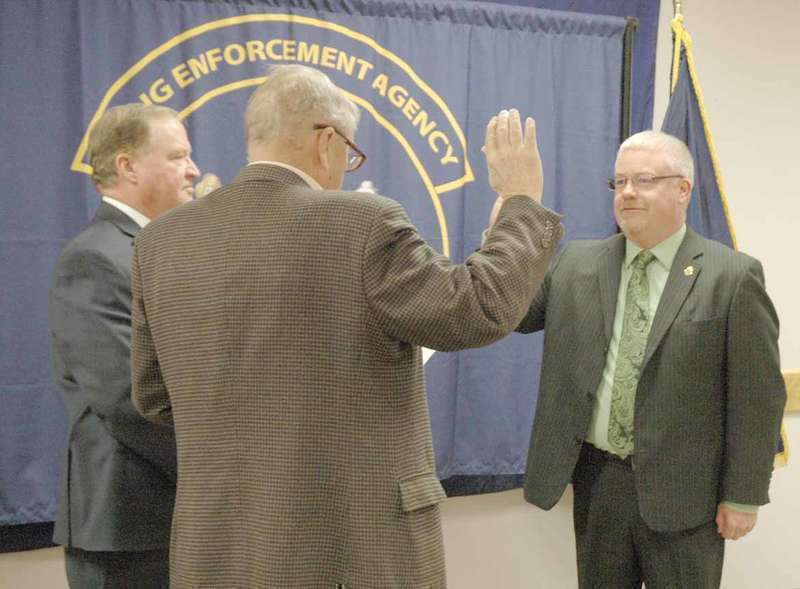 Crandall previously served 24 years with MDEA, first as a drug agent, followed by supervisor and northern commander . Last week on MSNBC’s “Meet the Press Daily,” host Chuck Todd congratulated U.S. 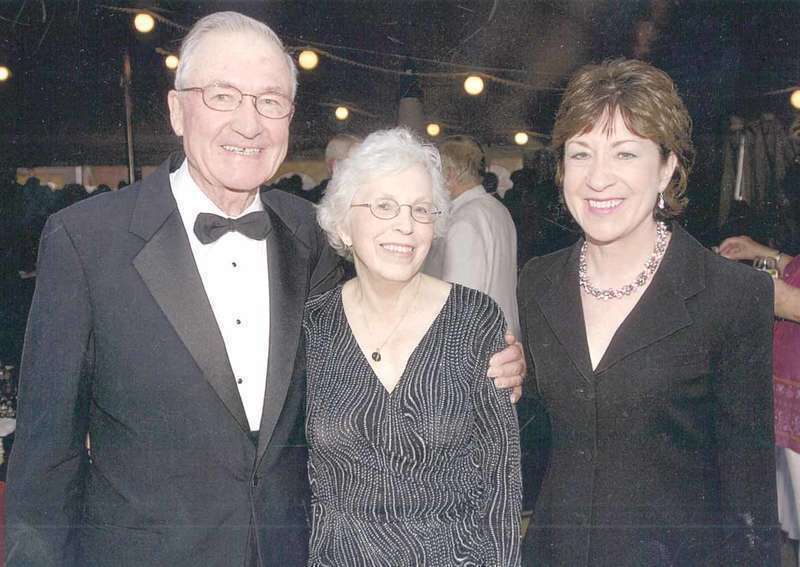 Senator Susan Collins’ parents, Don and Pat Collins, on celebrating their 70th wedding anniversary on Feb. 28. Mr. and Mrs. Collins first met as students at the University of Maine and were married in 1948. Kenneth “Bucket” Davis was given the Spirit of America award by Sen. Joyce Maker (R-Calais) last week in Augusta. The award, established in 1990, honors local individuals, organizations and projects for commendable community service. Davis has served as an East Machias selectman for more than 20 years. In a “significant investment” into the local community, Ian Pratt has announced that his Calais-based dealership will be expanding to include Chrysler products. The expansion – the first fruits of which will be visible within the new few weeks – will involve the construction of a separate 4,000-foot, four car showroom in addition to three more service bays and added parts storage space in the existing building. Maine’s land trusts have recently been the subject of scrutiny. As President of Downeast Coastal Conservancy (DCC). I welcome the attention, provided the facts are correctly presented. Unfortunately, public discussion about land trusts is often undermined by misinformation, and the public may not know the facts. As part of the multi-agency collaboration that area law enforcement is pursuing, the Washington County Sheriff’s office and the Baileyville Police Department are beginning a Crime Stoppers initiative for the local area. Crime Stoppers is a national program that offers cash incentives for tips leading to the arrest of law breaking individuals. At every opportunity, Harriet and Zeke plotted and planned their future. Harriet knew she must defy her parents. She was in love. Given time, they would forgive her. It wasn’t possible to be away from Zeke, no matter what they thought. The Bringing Hope dinner, sponsored by Vue by the Riverside Inn, has been postponed due to the storm prediction. The new date and time for the dinner is Sunday, March 18 at 5:30 p.m. The annual Easter Egg Hunt sponsored by the Ephraim Johnson Post #9 Auxiliary will be held on Saturday, March 24 at 11 a.m. The hunt will be held on the lawn of the University of Maine at Machias. Children should bring their own baskets or bags. Before leaving, families need to empty the candy into their baskets and return the plastic eggs to the Legion, as they are reused every year. For questions or to volunteer, call 255-8665 and leave a message. The Washington County Community Action team will host a Recovery Resource Fair on Friday, March 23, from noon to 6 p.m. at the University of Maine at Machias’ Reynolds Athletics Center, 116 O’Brien Avenue, Machias. The Henry D. Moore Library and Community Center in Steuben will host an Easter egg hunt 10 a.m. Saturday, March 24, at the library. The free event will include lots of eggs and egg-citing activities as well as an Easter basket raffle. The Easter bunny will also visit. For more information, call 207-546-7301 or visit www.moorelibrary.org/. MaineDOT has cancelled a preliminary public meeting for Machias, Dyke Bridge #2246 on Tuesday, March 13, due to an upcoming snowstorm. The preliminary public meeting has been rescheduled for Monday, April 2, at 6 p.m. at the University of Maine at Machias, Science Building Room 102. An Ecumenical Taizé Service for Lent will be held on Wednesday, March 21, at 7 p.m. at St. Aidan’s Episcopal Church, 36 Dublin Street, Machias. This service is sponsored by St Aidan’s Church; St. Peter the Fisherman Parish; Jacksonville United Methodist Church; and Centre Street Congregational Church, United Church of Christ. All are invited. A Taizé service involves singing, meditation, times of silence, Bible readings, and icons. There is no preaching. The style of worship has attracted many worshipers from around the world and from many different denominations. 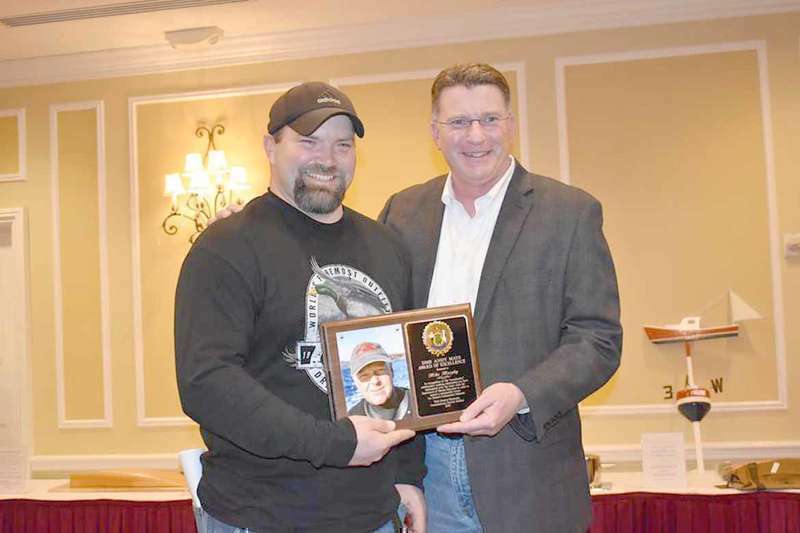 It isn’t easy to keep fishery news from Mike Murphy, but the Department of Marine Resources managed to do just that when they presented him with an award at the Fishermen’s Forum in Rockport on March 2. Get well wishes to Hazel Carter who has been in the hospital for an operation. Kathy Caler knows now how much people love her and Delbert. 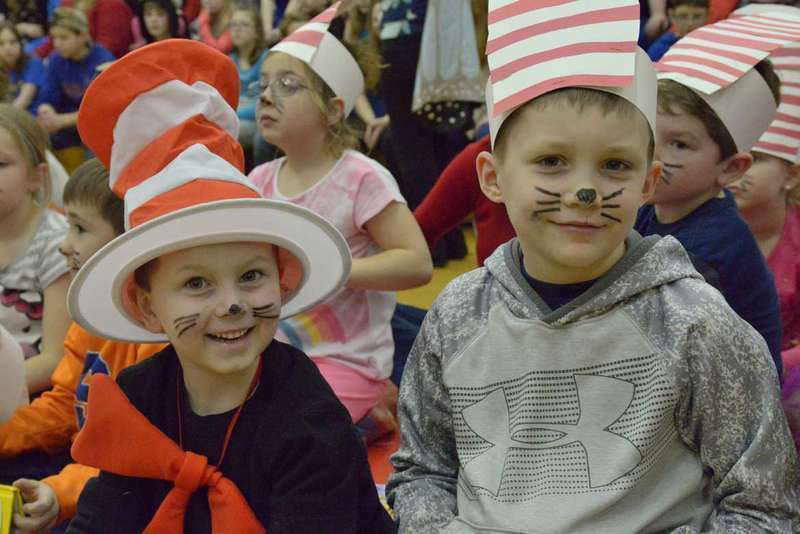 She had a celebration of his life on Saturday at the Harrington Elementary school. The cars filled up the parking lot and both sides of Route 2A. The flowers were beautiful. The service was very moving. Charlie and I went to Ellsworth to get a few items. It is nice to take a ride on such a beautiful day. Students and faculty from the University of Maine at Orono’s School of Performing Arts will visit Eastport on March 22 to work with local students and give a concert. During the day, UMaine jazz faculty, Dan Barrett, Mark Tipton, and David Wells, along with a student jazz combo, will give a combination presentation/performance at EAC for instrumental students from Calais High School, Washington Academy and Shead High School. “Memories of North Lubec”, featuring Donnie Alley and Wendell Small, is the first in a series of four monthly, informal get-togethers. On March 17 from 2 -4 p.m. come on in to the Lubec Memorial Library, 55 Water St, Lubec, pull up a chair, learn and share. Meetings will happen once a month to reminisce with long-time residents as they recall the good times and the not so good. Light refreshments. All are welcome. For more information call 733-2491 or visit: www.lubec.lib.me.us. 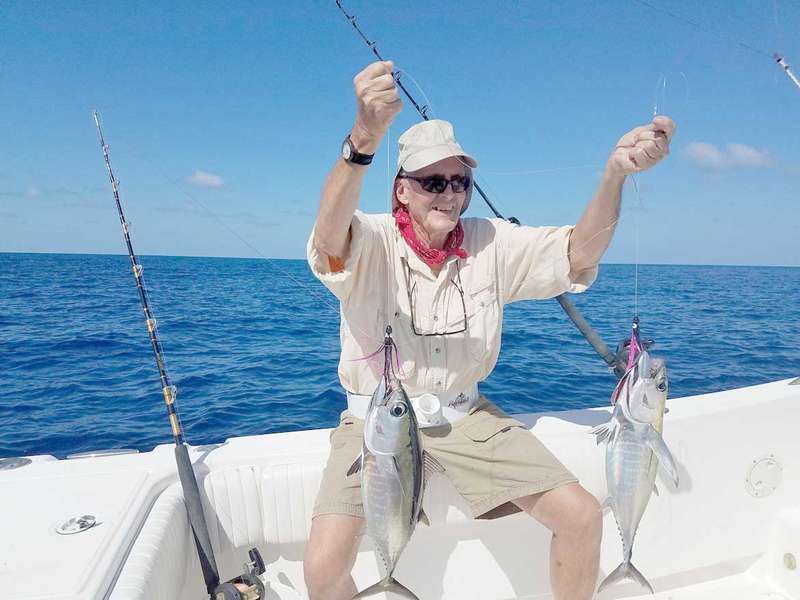 The Sunday Afternoons at the EAC series, an informal and interactive program every Sunday at 3 p.m. at the Eastport Arts Center, will feature an artist talk by Anna Hepler and Richard Van Buren on March 18. Based in Eastport and Perry respectively, the artists will converse about their work and studio practice. The H.D. Moore Library and Community Center, Steuben, will hold the third of its 2018 winter concert and art series 2 p.m. Sunday, March 18. This event will feature music by Brian Dyer Stewart and pottery created by Shelly Shapiro. On March 6, nine children at Washington County Children’s Program had their teeth checked by WCCP’s Dental Hygienist, Teresa Alley. The children’s individual staff practiced with them beforehand so they knew what to expect. In April, they will come to the dental outreach clinic and receive complete dental care by the pediatric team from NYU Dentistry. 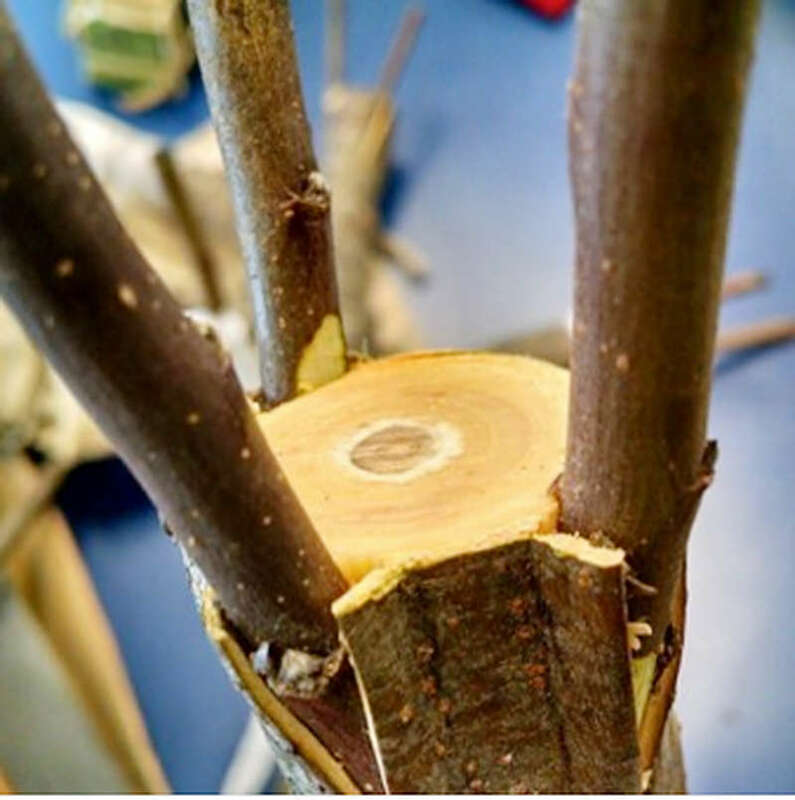 Grafting and pruning require only a few tools, and the techniques are simple and fun to learn. Join the Cobscook Community Learning Center, 10 Commisary Point Road, Trescott on Saturday, March 18, from 1 - 4 p.m. And, if you are already an experienced grafter or orchardist, come and share your knowledge with the group. Boy Scout Troop 125 of the Machias area is proud to announce an Eagle Scout Court of Honor to be held at 1 p.m. on Saturday, March 31, at the Fort O’Brien School Gym. This meeting is open to the public. A reception will follow the ceremony. 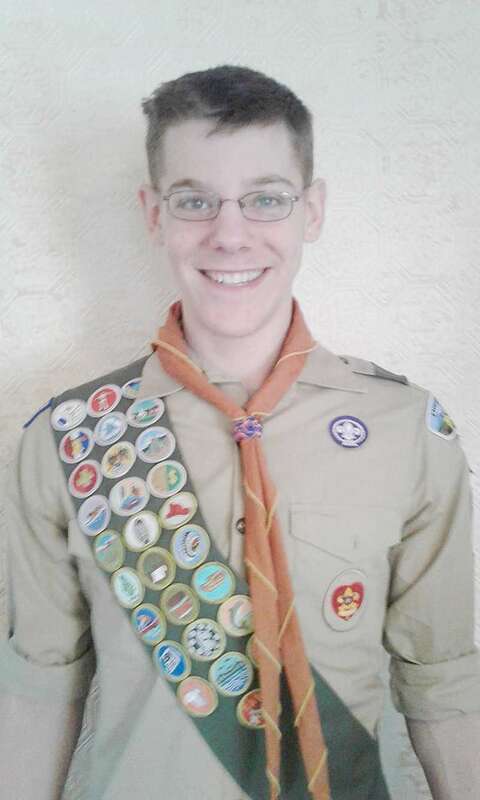 Caleb M. Norton will be recognized for attaining the highest rank in the Boy Scouts of America — the Eagle Scout rank. The troop will be conducting a ceremony that explains the fundamental principles of the BSA and that outlines the trail every scout must take to achieve the Eagle Scout rank. Sally D. Thompson, age 74, passed away peacefully with her husband and daughter by her side at Maine Coast Memorial Hospital on March 3, 2018. Sally was born April 21, 1943 in Machias, Maine to Kenneth and Minnie Driscoll of Columbia Falls. 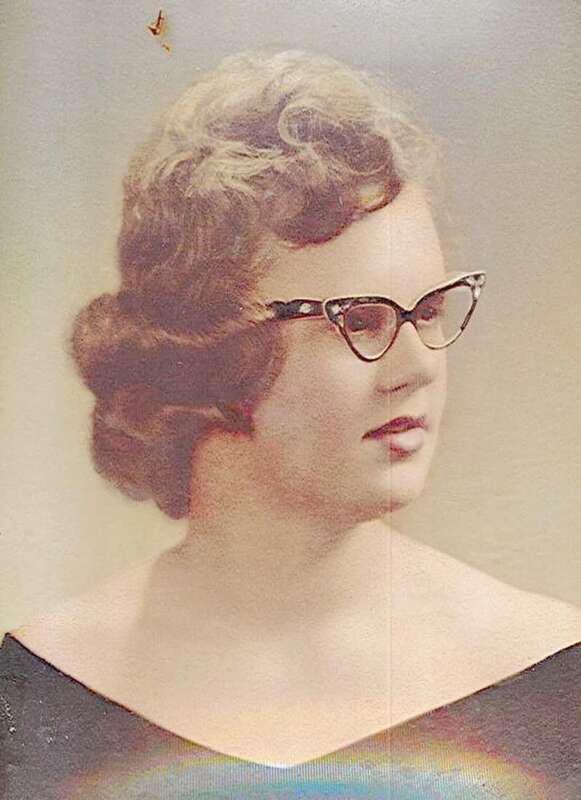 She spent her childhood in Columbia Falls where she attended grade school and graduated from Columbia Falls High School in 1961. 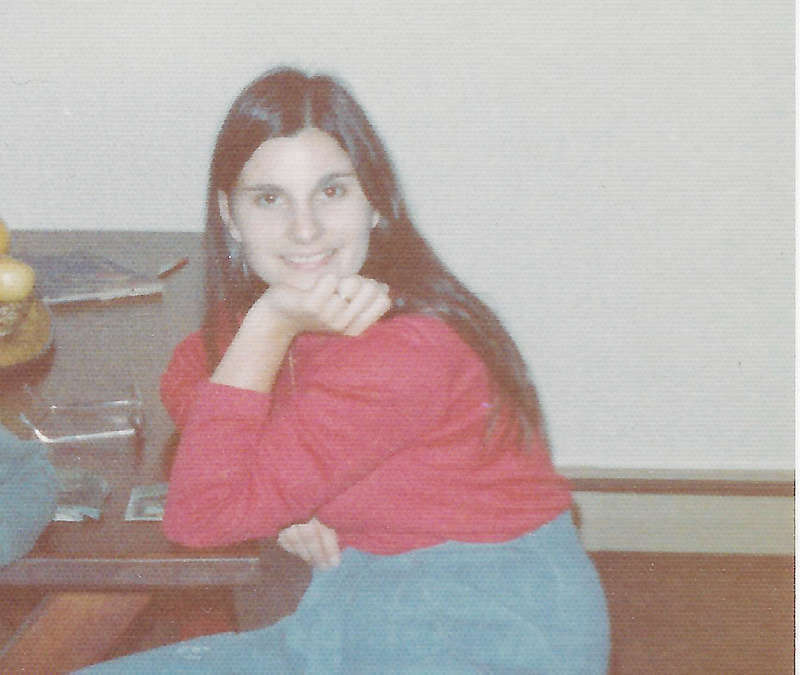 Sally went on to further her education at Washington County Teachers College graduating in 1965. Education was very important to Sally, she called herself a lifelong learner. Agnes Arlene (Gray) Diffin, 94, of Waterville, passed quietly away on March 4, 2017 at the Lakewood Continuing Care Center. She was born in Wesley, Maine on April 3, 1923, the daughter of Roger A. Gray and Minerva (Sharman) Gray. 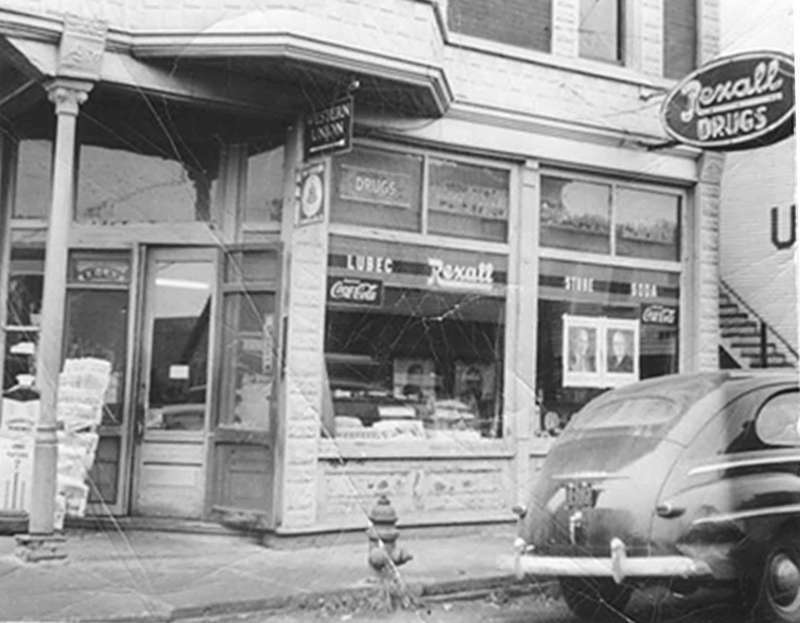 Agnes graduated from Washington Academy in Machias and Washington State Normal School in Machias. 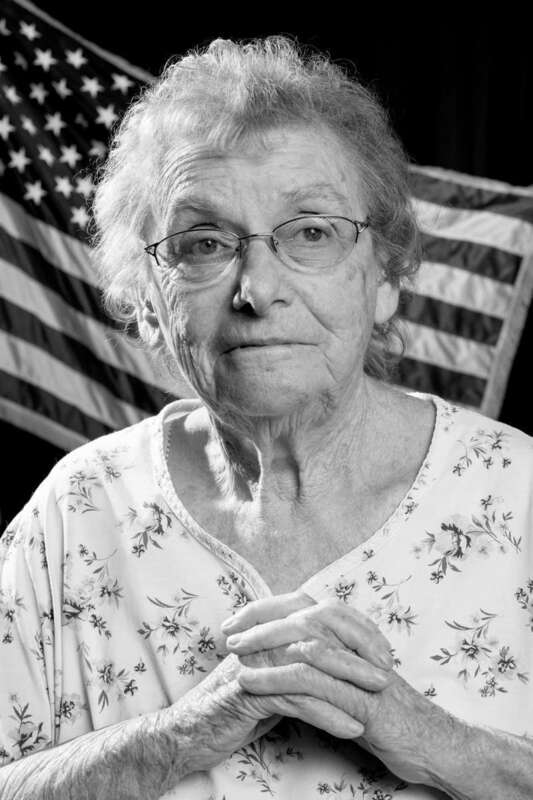 She graduated from the University of Maine, Orono in 1948 with a Bachelor of Science degree, returning later to earn a Master of Science degree in education. 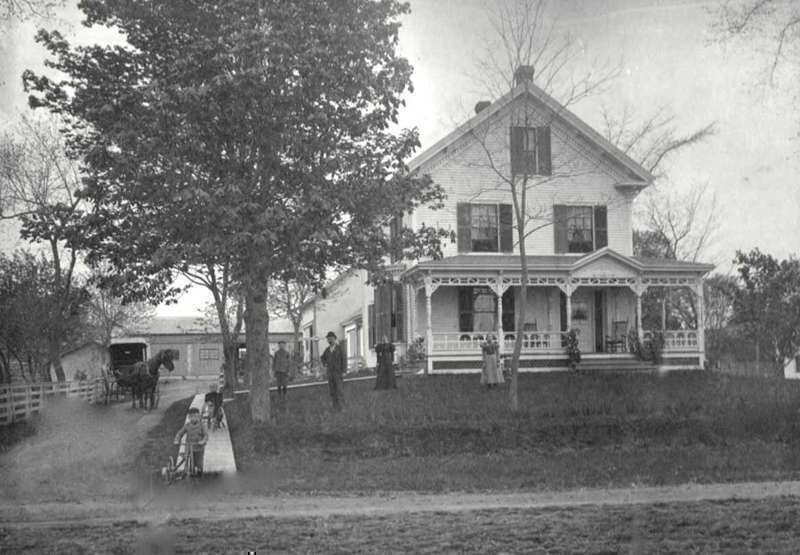 A thesis which she wrote at the University of Maine was on the social history of Machias. It has been a little over a decade since my brother David passed away. He had just turned 40 years old. He died of a genetic heart condition. The time spent with him was cherished. With every step that David took on this earth, every step that paved the way to greatness, every step turned him into being the best brother that he could be. David’s blond hair would wave in the cool air of a summer’s day, where the sun bleached the sky. His big, blue eyes would glow on a clear day. His muscles showed the evidence of doing all the farm chores over the years. This past week I finished “The Fiery Cross” by Diana Gabaldon’s Outlander series. The book is a large one so it has taken me quite a while to finish it. Now maybe I can get something else done. I don’t plan on starting the next one as I have some genealogy to get done for a couple of folks. Andy came over on Sunday morning to cut a tree that was on a sap line. R.Z. helped him move an old gas stove down to the other sugar shack with help of the tractor. Andy took home 15 gallons of sap to boil down at home. I’ve been boiling down sap for maple syrup for over a week in my kitchen on my new gas stove. Richard is all done making his syrup, which he had been doing for over two weeks, and gave me over 30 gallons. Senior veteran guard Alex Marotta savings the ball on the endline. Guard Alex Wentzell getting the shot off over the defender. 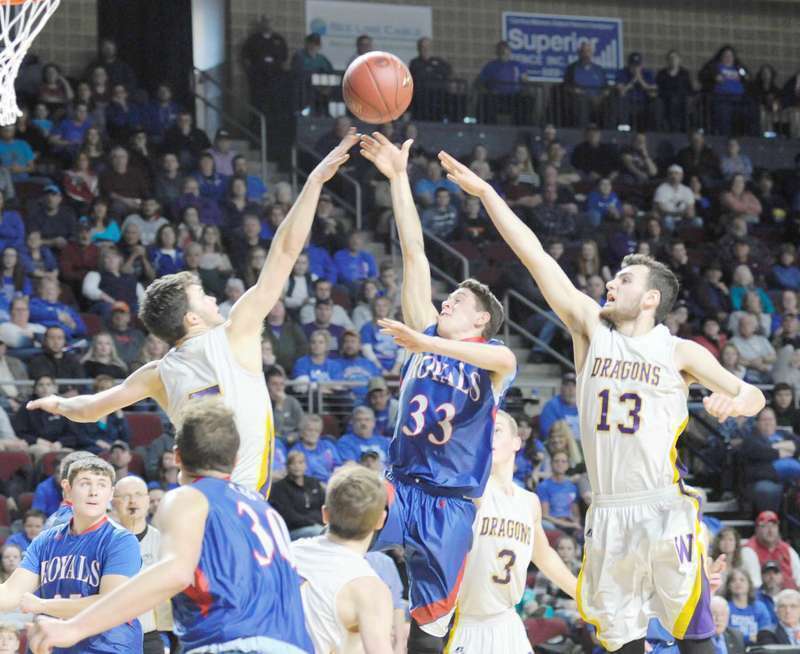 The second-seeded Lady Dragons of Woodland lived up to their number two ranking with quarter-final and semi-final victories over Schenck of East Millinocket and Deer Isle-Stonington before losing to the top seeded Southern Aroostook Warriors in the Northern Maine Class D championship game. It was wonderful to have some of our first responders on hand this week for Fire Prevention Day. A huge thank you to Joe Thompson and Andy McKenna for doing such a wonderful job of educating our students in fire safety and for bringing their gear so that the children could see first hand what a firefighter looks and sounds like in a rescue situation. A special shout out to our very own in-house firefighter Mrs. Becky Lee who not only organized the visit but also geared up and joined in the trainings. The Machias Selectboard discussed whether or not to propose a recreational marijuana moratorium at their meeting held Wednesday, Feb. 28. 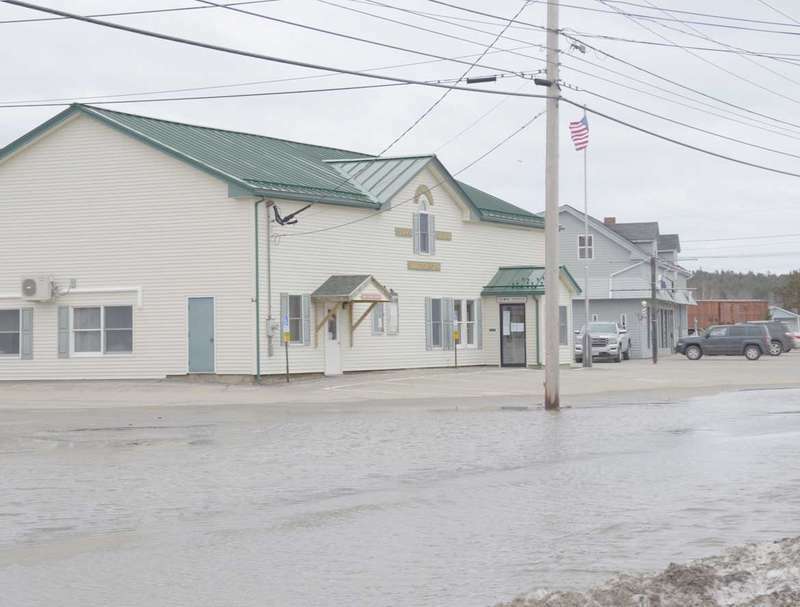 Bold Coast Cannabis of Machias previously submitted an application for a recreational marijuana retail establishment license, prompting the selectboard’s discussion. However, the legislature then moved the end of the statewide moratorium from Feb. 1 to April 18, making the issuance of licenses premature. The fight to keep the Downeast Correctional Facility open may still be on a long road, but it’s taken a few new turns. 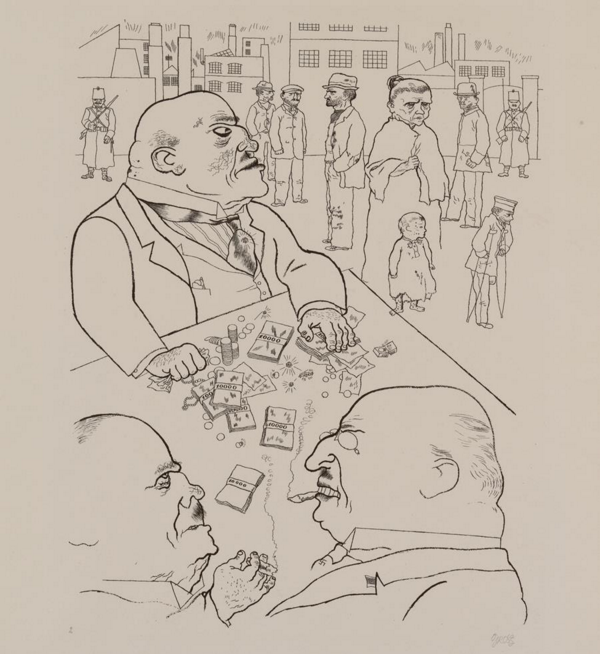 According to Tuell, those seven critical votes may no longer be needed. “We have a few more roles to play out,” he says. “We may need those seven votes, or not. We won’t need them if it’s not considered an emergency. 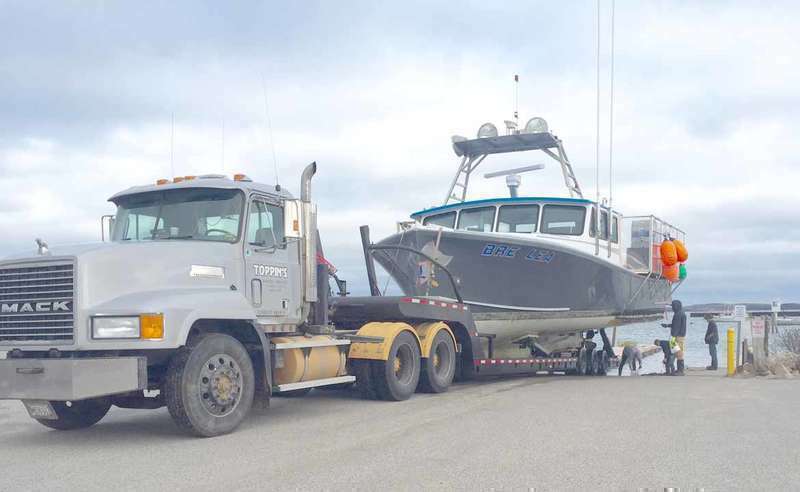 Jonesport officials talked trash — again — at their March 7 meeting, a discussion prompted by remarks from Selectman Harry Fish, who is also Jonesport’s representative to the board of directors of the Pleasant River Solid Waste Disposal District (PRSWDD) that operates a transfer station on Route 1 in Columbia Falls. 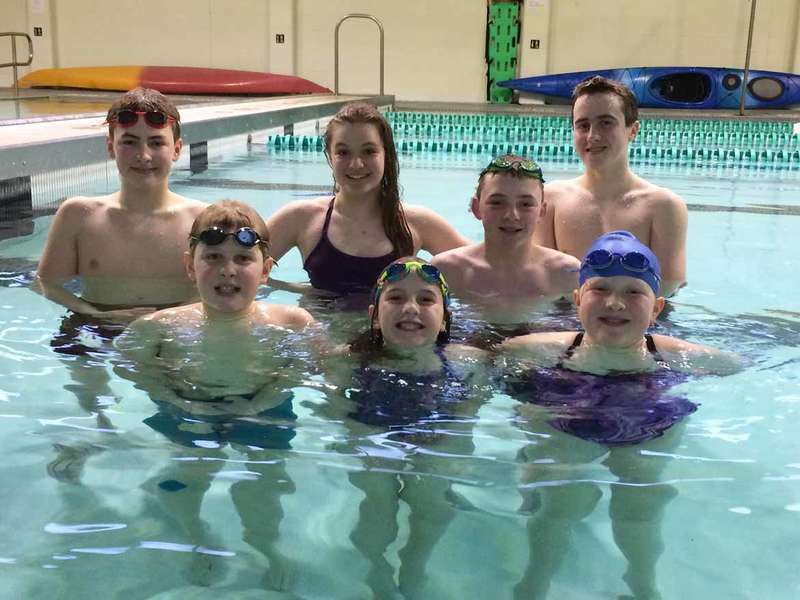 The Machias Valley Swim Club (MVSC) is sending its largest group yet to the Maine Swimming Junior Olympic Championships, to be held at Bowdoin College in Brunswick this week. Seven of the team’s 26 members will compete in the three-day event under the guidance of swim coach Lindsay McMahon. To qualify, athletes must meet competitive time standards. The team consists of Ava Emery, Zain Fitzsimmons, Caleb Campbell, Carson Prout, Luke Campbell, Lily Campbell and Lucy Lord. 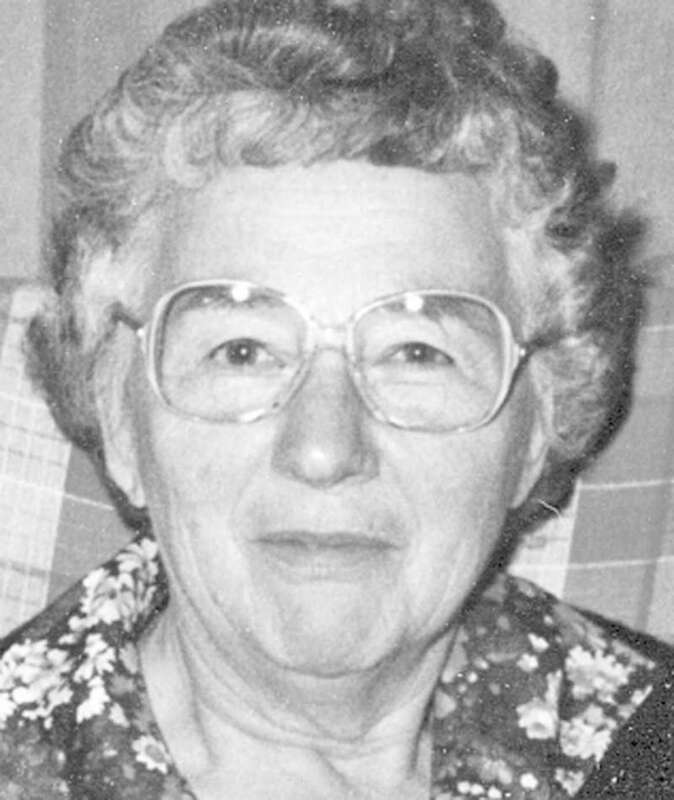 Frances was born in Eastport on March 19, 1921, the daughter of Leigh and Bernice Pottle. She was a graduate of Machias Memorial High School, Class of 1938. She obtained a B.S.